The sheep they breed and the wool they provide have always been important to the people of Swaledale. Here in one of the most beautiful areas of Northern England the tradition of hand knitting in local wool goes back over 400 years to the days of Queen Elizabeth I. It was Elizabeth who set a new fashion by wearing hand knitted stockings and, with demand increasing, every family in the Dale - men, women and children - became involved in knitting woollen stockings. By the end of the 19th century however the lead mines were gradually closing and changes in fashions together with the arrival of knitting machines ended most of the Dales hand knitting trade. In the early 1970's the people of Swaledale revived the art of hand-knitting and Swaledale Woollens cottage shop was opened in Muker, a picturesque village in the heart of the Yorkshire Dales National Park. Today there are over 30 people knitting from their homes and producing a unique range of quality woollen knitwear. The wool provided for the knitters is mainly from Swaledale sheep, but we also use the different shades and textures provided by the nearby Wensleydale breed and Welsh hill sheep. Some of the wool is dyed to provide beautifully harmonious country colours. In 2002 Kathleen Hird took over the business from Mr & Mrs David Morris. Kathleen was dedicated to keeping the old traditions alive in Swaledale. 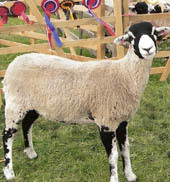 Some of the Swaledale wool comes from Kathleen and husband Kenneth's own prize-winning Swaledale sheep. The wool from the Wesleydale sheep is sourced from farms in the neighbouring dale. The Swaledale, Wensleydale and Welsh wool are organically spun and finished at the environmentally friendly Lanark Mill in Scotland, which uses renewable energy to power the mill and its 19th century spinning mule. Then it is dyed in to soft country colours and delivered to Muker. Real horn buttons are used on many of the garments. On the 7th April 2014 Kathleen retired and handed over the business to Ken & Gillian Whitehead, local Swaledale Sheep farmers from the neighbouring village of Thwaite. They are gearing themselves up for a busy year ahead with celebrating 40 years of the business and The Tour de France cycle race passing the front of the shop on Saturday 5th July. We're sure that over the centuries woollens has had many different spellings; here are some that we see: woolens, wollens, and woollens.